I picked this up at my local WoodCraft store on sale about a month ago. I saw it laying in a opened box and thought that I would give it a quick look. I was not looking to buy a vise at the moment, but I knew I would be needing one sooner or later. This vise appeared to be pretty well made, so I ended up cashing out with it. I finally got around to mounting it to my “crapper” work bench this weekend. The bench in the picture was actually built during a lunch break as a tool storage table on my last house “rehab”. Here is a review of the install and operation. 1. Fit and finish: The overall machining is pretty good. I did notice that the rear retaining plate had very sharp bores. I chamfered the bores to with a file to prevent them from catching the guide rods from any misalignment issues. The quick release mechanism is in 2 pieces and fit into the rear retaining plate very well. 2. Install: I have a skirt 2X4 skirt on my bench, so I had to bore through the 2×4 and plate. The install is pretty straight forward regardless of the poor PDF. file that WoodCraft provides. I shimmed the the rear retaining plate with wood scraps that were laying around. I think it is off by 1/8” or so….... no big deal. When I went to install the vise handle, I found that the 1” handle that WoodRiver suggested is to sloppy. I will probable have one of my wood turning friends turn down a 1 1/4” dowel for me. As you can see in the pictures…..my handle is temporary. 3: Wood for jaws: When I installed the wood for the front jaw, I left it with about a 1/4” jiggle room. Allowing a loose fit will allow tapered stock to clamp down without tapered jigs. 4: Lubrication: This vise needs a very light grease because the quick release mechanism will stick to the threaded shaft and not release properly. I ended up going with “Liquid Wrench” white lithium. 5: Operation: The operation is pretty smooth, and it feels solid. The guide shafts need to be slid back and forth a couple dozen times before the vise feels smooth. After that, it feels like butter. I put all my weight onto the handle while clamping down on a piece of 2X4 and it still released smoothly afterwards. Conclusion: WoodRiver obviously did not pay attention to the handle bore so it could accept standard “off the shelf” dowel dimensions. The installation instructions are adequate, but should be more defined for a less experienced customer. Overall…......... I would recommend this vise to anyone. I use Harbor Freight end vises. (the jaws are not parallel). Ah! You’ve given me a great idea for my vice, Paul … line the jaws with some scrap cedar. If I design it properly, they can be removed quickly, so my husband can use the vice for yucky stuff. Now, to find the time. But … it would definitely take me longer than a lunch hour to whip something that simplified up! Great work bench!! Justoneforme, you can bore a couple of shallow holes in each cedar jaw liner for magnet inserts. Those rare earth magnets stick like glue! 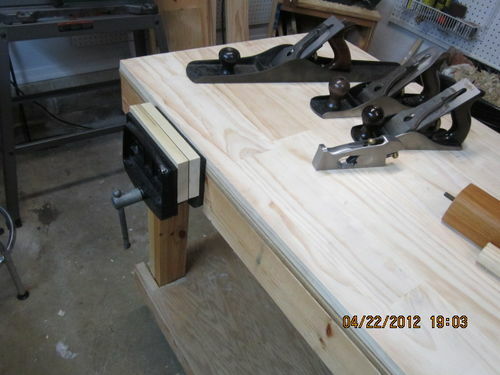 Just as a warning… I bought this vise from Woodcraft online a few months ago and installed it on the bench I am building. I did most of the same things to fit the vise to the bench as you did. However, after a few times clamping and unclamping a piece of wood to see if it worked, the collar on the quick release snapped (Yes, the solid metal quick release snapped) under very little EVEN pressure. I called Woodcraft and they sent me a new quick release free of charge/no questions asked. It came in its own plastic packaging which now makes me wonder how often they are contacted to replace this exact same piece. I installed the new quick release and the only problem I have now is that it slips under the same minimal pressure that snapped the first one (may be user error). I will keep playing with it, but right now, it seems like I got what I paid for… Also, the handle fits a 27mm dowel perfect. Good Luck. Good to know, I hope it holds. you definitely can’t beat the price for a quick release! Thanks for posting your follow up. I was just about to buy this and now I’ll be looking elsewhere. Carl, I went with the non-quick release front vise from lee valley. I am not sure how their quick release version is, but I started to get concerned that at the price point I was looking, maybe I shouldn’t tempt fate on another quick release unless it was a top of the line vice.